If you’ve experimented with cloud solutions you’ll be excused if you start wondering how you managed your practice without these technological innovations. The year 2018 is abuzz with cloud solutions and amazing digital advances that are transforming dentistry. Leading dental specialists are delivering unique and personalized oral treatment leveraging new age technology. No, this is not about cold calling patients or patients calling dentists querying dental services. Teledentistry is bringing affordable dental care to a wider spectrum of patients. The dental hygienist sets up shop in a remote community and sees the patient. Session notes including images are mailed directly to the consulting dentist using cloud-based software. The consulting dentist provides diagnostic inputs and keeps the patient’s insurance provider in the loop via the cloud. The insurance provider communicates via the cloud what the policy covers and what it doesn’t so that the patient can make an informed choice. The patient is referred to the primary care doctor or an emergency care facility within the community. The specialist’s prescribed treatment schedule is implemented by the local dentist. The cloud system allows patient-to-doctor and dentist-to-specialist communication to clear doubts and compare treatments. This system is already making a huge difference to patients in senior care homes and assisted living facilities. Imagine the potential cost savings in off-site dental care for patients in remote areas. A physical examination of the oral cavity doesn’t stay in memory when you are dealing with scores of patients on a daily basis. Plaster impressions, prosthetic inlays and onlays, construction of supporting frames, fixing of crowns, partial dentures, and implants are cumbersome and time-consuming because these procedures need repeat patient visits to check teeth alignment. Welcome to live feeds through Intraoral scanners (IOS); these are devices that give you real-time scans of the oral cavity and every part of it. A structured light source or laser scans the teeth, tissue, and gums and conveys data through imaging sensors directly to a software. A 3D model of the oral cavity is created by the software providing a virtual image that can be examined from any angle. The dentist superimposes different models over the 3D rendering to test the efficacy of treatment options without calling the patient for repeat visits. The software integrates easily with lab systems and permits a collaborative approach to dental treatment. You get accurate optical impressions, your time efficiency increases, and the clinical practice gets a much-needed technology boost. The sight of a dentist and an injection syringe increases anxiety, raises the heartbeat and virtually terrifies people into avoiding dental care until the underlying complication becomes too chronic to ignore. A new innovation eliminates fear and pain with a feather touch. The Single Tooth Anesthesia Wand applies anesthesia directly to the base of the tooth. The drug can be measured and delivered accurately after locating the best spot for injection. The side of the mouth isn’t immobilized. The patient can follow his dietary routine unaffected by speech slurring or numbness. This is a slim handheld wand with a powerful camera and light source at the tip. Guided into the mouth, it transmits live images to a computer monitor, enabling both the doctor and patient to view the state of oral hygiene. It’s great news for the patient who gets to see before-and-after images that improve knowledge, create oral health awareness, and build confidence and trust. The technology stores images in the system that can be shared with other specialists to follow up treatment and the insurance company for claim processing. Stored images help the doctor in reviewing treatment plans. The device is inexpensive to install, and the patient will reward you with his undying gratitude for the guided tour of his oral cavity. This is an app that patients can access on their mobiles, tablets and laptops. It carries data and images of their oral cavity and educates them on what needs to be done following each visit to the clinic. The app provides an interactive patient care system. Treatment plans and costs can be compared, reviewed, and decided. The app encourages the patient to take more preventive care. It empowers the patient with precise knowledge that makes interaction with dentists easier. The patient feels that they are more in control of their treatment and is not wholly dependent on the dentist for inputs. Don’t you feel frustrated being tied to your clinic because both the patients and individual patient records are available only in the clinic? Imagine accessing your patient information anywhere, anytime at your convenience even if you’re not directly present. That would make you more time efficient and help you deliver better results. You could also improve the patient experience through personalized care. This is now possible by live streaming huge quantities of data to the cloud. And this includes access to 3D imaging. This means that you could be anywhere and remain connected through the cloud to view the patient and even guide your assistants as they perform surgeries. 3D imaging has huge potential. 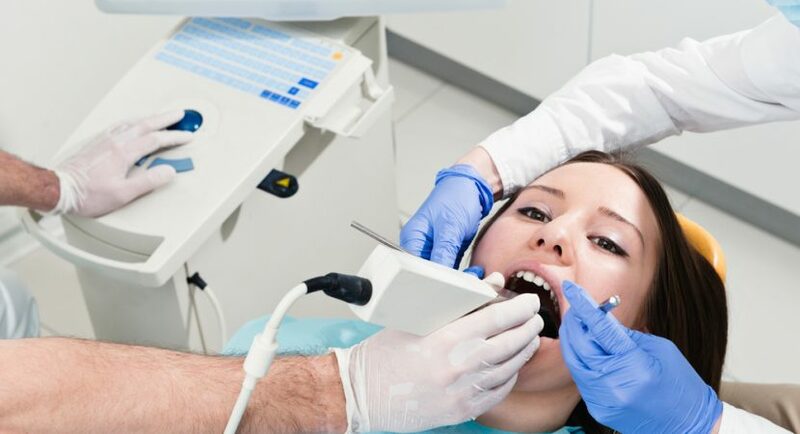 It is already capable of detecting tumors, estimating the depth of roots, assessing the damage of impacted teeth, and the detection of root causes of Temporomandibular joint (TMJ) syndrome. What we’ve discussed are important technological advancements that are trending in Dentistry. The blockchain powered cloud technology is capable of shifting enormous data to the cloud, making patient information readily accessible anywhere, anytime. Your patients emerge educated and empowered. The patient carries a favorable impression of you once they see technology enhancing their comfort at the clinic. A great first impression translates to word of mouth publicity which in turn increases patient footfall, growing your practice. Tech Fuga Copyright © 2019.